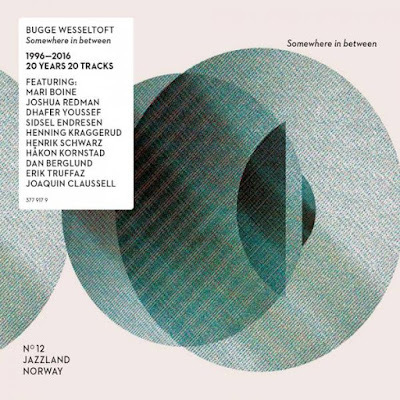 I missed out on pianist and producer Bugge Wesseltoft the first time around: I think I found the idea of a "New Conception of Jazz" a bit daunting when I was struggling to get to grips with the old conception! This compilation of twenty tracks spread over two disks, released to recognise the twentieth anniversary of "New Conception of Jazz", the first release under his name, seemed like the perfect way to remedy that omission. The music covers several albums and features a variety of musicians from a variety of genres; whilst now it doesn't necessarily sound new, it does present a certain consistency of vision - and it has its roots firmly in jazz. Wesseltoft seems to bring a fair bit of soul to whatever he plays, and his sense of rhythm means he can get even ice cold electronics to groove. Some of the tracks are as they were released; others have been remixed, and a few completely recorded anew, whilst still others are released for the first time here. Most of the material is written by Wesseltoft, with a couple of standards. The quality of the musicians who collaborate with him speaks volumes. Saxophonist Joshua Redman appears on the lovely Oh Ye, with Wesseltoft playing the Hammond B3 organ. Dan Berglund takes what is almost a solo role playing bass on an arrangement of Round Midnight (which is curiously credited to Mingus, not Monk), with some very sparse piano work from Wesseltoft. There are two previously unreleased tracks as a piano trio with drummer Gregory Hutchinson and bassist Joe Saunders, Wesseltoft showing what a thoughtful pianist he is in a straight ahead jazz environment. There are several pieces which folk or world musicians collaborate too. Hope features haunting, powerful vocals from Dhafer Youssef. On Yoyk, Sami vocalist Mari Bione provides equally affecting singing over a funky accompaniment from Wesseltoft on Fender Rhodes - two styles which one might expect not go together, but actually work superbly. Wesseltoft's unaccompanied pieces are compelling, too. His slow rendition of How High The Moon has a sparse simplicity, an evocative exploration of what might be considered a clichéd standard. Mitt Hjerte Alltid Vanker (my heart ever wanders), a traditional Scandinavian Christmas song, is similarly paced, with lots of space. The variety on this release is impressive. Whatever the situation - solo, small group or larger ensemble; with long term associates or one-off collaborations - Wesseltoft seems to produce music full of emotion and authenticity.